Graphics One is pleased to announce a complete garment production and marketing system for those wishing to enter the transfer business. 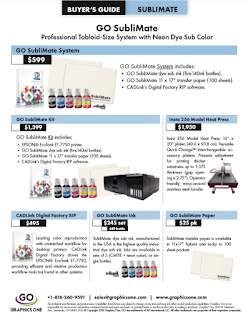 In conjunction with Graphics One, Oki Data have launched the 2 for 1 Printer Plan. The 2 For 1 Printer Plan provides a free OKI C711G with the purchase of an OKI pro920WT printer. The 2 For 1 Super Bundle List is $9,195 and is available for a limited time.